Africa Mining IQ, Africa's largest online mining intelligence database, currently indexes over 25 mining projects in Sierra Leone as part of an intelligence database listing over 1 850 projects in Africa. These include 6 diamond, 5 gold, 11 iron ore, 2 nickel, 1 uranium and 1 industrial project. The Baomahun Project. With a project value of over R1.5 billion, the resource is estimated to contain at least 200 000 ozs Au. Reserves support an open-pit operation with an average annual throughput of 2 Mtpa over a 10 year production life. The Marampa Iron Ore Project. The R2.6 billion Marampa project has early stage cash flow potential from the 80-90 million tonnes of iron tailings at the old mine, while a JORC Mineral Resource of 680 million tonnes Mt at 28.2% Fe above a cut-off grade of 15% Fe over four deposits provides massive later hard-rock potential. The Komahun Project, Nimini Hills. With an exploration value of R132 million, the site has a Measured and Indicated Resource of 110 000 ozs grading 9.1 g/t Au and Inferred Resources of 435 000 ozs grading 4.3 g/t Au across a mine life of six years. Track, target and record these mining projects with accurate information, updated daily, by subscribing to Africa Mining IQ! Powerful search facilities ensure you exactly what than you’re looking for! 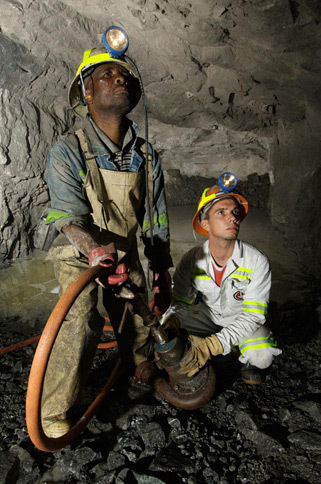 As Africa's most comprehensive mining intelligence portal, Africa Mining IQ currently assists over 170 companies grow their businesses by providing essential mining industry data for mines in all phases of operation. The extensive database contains information on everything from location of project and capital, exploration values to key contact details on mining in Sierra Leone and throughout Africa. Africa Mining IQ categorises all projects for mining in Sierra Leone in terms of grassroots, pre-feasibility, feasibility, bankable, active, operational and dormant phases for an easy-to-use information database. Contact Africa Mining IQ today on +27 11 830 2132 to find out how to expand your business within the African mining industry!